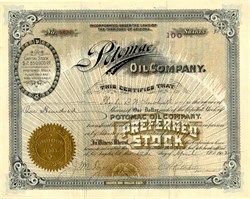 Beautiful certificate from the Potomac Oil Company issued in 1902. This historic document was printed by Los Angelos Litho Company and has an ornate border around it with a vignette of the company's name and gilded overprint. This item has the signatures of the Company's V. President and Secretary, J. M. Dye and is over 105 years old. J. R. Wilder, and Hunsaker & Britt, for Petitioners. C. E. Arnold, and J. W. P. Laird, for Respondents. ALLEN, P. J.�The material matters set forth in the petitioners' application for this writ are fully stated in Potomac Oil Co. v. Dye, 10 Cal. App. 534, [102 Pac. 677]. Upon that hearing there was involved the sufficiency of the petition, the jurisdiction of this court to grant relief by mandate, and its appropriate character to compel a person claiming to act as secretary of the corporation to deliver up to the corporation its seal, books, papers, records, etc., all of which matters were determined in favor of petitioner, and require no further consideration or discussion upon this hearing. In the single issue presented by the amended answer as to the official character of petitioner is involved practically all of the questions presented for determination upon this hearing. The burden is cast upon petitioner to show that he is the legally appointed secretary of the corporation and entitled to the books, papers and seal of such corporation. The facts connected with the establishment of such official relation of petitioner are before the court in the report of a referee heretofore appointed to take testimony, and in certain depositions and exhibits on file. From all of these it is made to appear that the Potomac Oil Company was organized in 1901 under the laws of the territory of Arizona, having a capital stock of $2,850,000, divided into 2.850,000 shares of the par value of one dollar each; that by the articles and by-laws the affairs � i the corporation were to be conducted by a board of five directors, the first thereof to be elected upon the first Monday in August, 1902, and annual elections to be thereafter held upon the corresponding date of each succeeding year; that in 1904 a stockholders' meeting was held, at which five persons were elected directors, and that no election has been held between that date and the 29th of December, 1908, when a new board was sought to be elected under proceedings hereinafter to be noticed. The directors elected in 1904, or their successors appointed by the board to fill vacancies, elected respondent Dye secretary, and as such secretary he took charge of and has had in his custody all of the books, papers and seal of the corporation, which he removed to and has ever since kept within the state of California, and within this district. The corporation, while organized in the territory of Arizona, had no place of business in that territory, maintained no office, owned no property, and conducted no business in said territory, all of its property and business being within the stnte of California and within which state all of its directors, including the secretary, were residents. Stockholders whose holdings aggregated about one million shares of the stock, becoming dissatisfied with the management of the corporation, demanded of the officers of the corporation, in September, 1908, that they call a meeting of the stockholders for the purpose of electing a board of directors. This the officers of the corporation refused to do, and have endeavored through such refusal to permanently keep and maintain the control of the corporation and its property. Basing their action upon such refusal, shareholders in their own behalf and in behalf of other dissatisfied stockholders, commenced proceedings in mandamus in the district court for the third judicial district of Arizona, praying that the court command and direct the defendant corporation and its officers to call a meeting of the stockholders, as by the articles of association and by-laws required, for the election of a board of directors. An alternative writ was issued directing said corporation and its officers so to proceeed, or show cause, which writ was served upon the corporation through a service upon a resident agent of said corporation within the county and territory where the proceedings were commenced, and service upon the individual members of the board by mailing copies of the alternative writ to their postoffice address and place of residence in California. The corporation duly acknowledged in writing the receipt of the writ, and all parties having made default at the time and place to show cause designated in the alternative writ, a peremptory writ was issued by the court, by which writ they were commanded, on or before the twenty-first day of November, 1908, to call a meeting of the stockholders and to give the notice required by the by-laws for the election of a board of directors, which said peremptory writ was served in the same manner as was the alternative writ. The Potomac Oil Company and its officers, having failed and refused to observe the mandate of the court, upon petition and affidavit showing such facts to the court granting the peremptory writ, an order was made on November 21, 1908, appointing a special officer and commissioner to do and perform the acts and things which the said respondents were by said writ directed and commanded to do and perform. On the 28th of December, 1908, a petition in error to the supreme court of the territory of Arizona was filed by the respondents in the mandamus proceedings, and on the same day a bond, with the sureties approved by a judge of the district court of Arizona, was filed with the clerk of the district court for the third judicial district ; and on the twenty-ninth day of December, 1908, a summons in error was served upon petitioner. No order staying proceedings, however, appears to have been made by the lower court. On the 28th of December, that being the day fixed in the call for a meeting of the stockholders by the special " fficer and commissioner theretofore appointed, stockholders owning or representing 1,878,132 shares of the capital stock of the corporation met at the time and place by the commissioner designated, and, after electing one of their number chairman and another secretary, proceeded to the election of a board of five directors for the corporation. These directors thereafter met and appointed petitioner herein as secretary of the corporation. Thereafter, the proceedings in error in the supreme court of the territory of Arizona were dismissed. Due demand was made by petitioner upon respondent Dye for the books, papers and seal of the corporation, delivery of which was refused. After the commencement of these proceedings, and when the referee appointed by this court was taking testimony pursuant to order of the court, a subpoena duces tecum was issued and served upon respondent Dye, requiring his appearance before the referee, and to bring with him the books and papers of the corporation. Tender was made of the fee provided by law, which respondent refused to accept and failed to observe the subpoena. Thereafter, on June 7, 1910, respondent Dye presented a resignation to the individuals composing the board which originally appointed him, and such persons, assuming to be directors of the corporation, made an order appointing one Scott secretary, and thereupon Dye turned the books, papers and seal here in controversy over to Scott, who is now in possession thereof. These facts coming to the attention of petitioner, a supplemental petition was filed setting forth those facts and asking board to control the business affairs of the corporation under the statute. The corporation thus designating them as the governing board in the first instance vacated such appointment and selection and substituted a new board. The authority of the old board then ceased as between the individuals constituting such old board and the corporation. Such individuals thereafter possessed no rights in the management and control of the corporate affairs as against the corporation. Their attempt to elect a secretary after they had ceased to be a board of directors was futile, and Scott did not acquire even a color of right to the office, or an appearance of right to retain the books or papers of the corporation. When this court issued its alternative writ and caused the same to be served upon Dye, who was then the custodian of the books and papers, and directed him to turn the same over to petitioner, or show cause, it thereby acquired jurisdiction, not only over the person of Dye, but over the books and papers in his possession, the subject of controversy; and Dye could not by thereafter dispossessing himself of the property deprive this court of its control over such property, or over himself as the respondent. Scott, with full knowledge of the circumstances, taking possession of the property acquired no right thereto; did not and does not hold the same as secretary, or in any other official capacity, but holds the same for Dye, whose duty it was to retain the possession until the final disposition of this case.